The game begins with a series of set up questions and lessons - what is your name? here's how you save, etc. 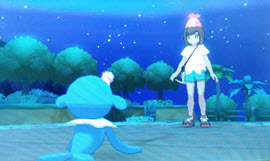 The main character has a pet meowth at home, which is actually very adorable *meow* The local island leader met me in the midst of a little adventure and offered to give me a pokemon to start my journey. Would I choose the little owlet, the fire kitten, or the cute seal? 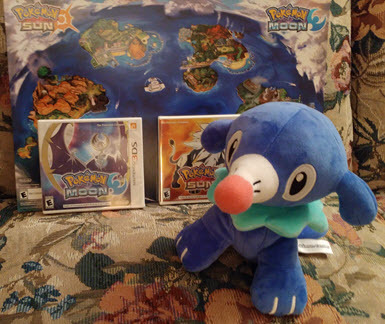 I chose Popplio! 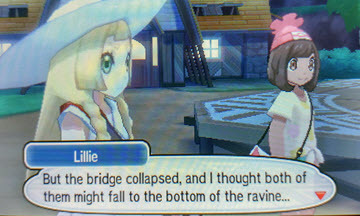 :) One of our first adventures was exploring route 1 to find the professor's office. There, we got the pokedex. Then, we had to go to trainer school, where we battled a few other students and the teacher. After graduating from there, we could venture into the capital city and were free to start the main story. In the grass around Route 1, I caught a pikipek woodpecker and added him to my team. His fighting move came in very handy against the enemies that I encountered early in the game. There are some grassy spots in Hau'oli City, too. I caught a dark Meowth outside the Pokemon Center and was rather taken by it :P When he attacks with his claws, he jumps and flails around in a silly, dramatic way. But then he lands and has a chill expression. Meow! Meow^^ :3 I kept him on my team because he is fun to have around. While Chansey, Popplio, and I continued our way around Melemele Island, we discovered a beautiful yellow meadow at the north end of the island. The music is lovely as flower petals gently float through the air. There's a man there who says something like this: "I'm looking for my girlfriend. She has a tendency to run off when she sees something interesting." hm, oops <.<; While I was there, I caught a yellow Pom Pom Oricorio and nicknamed her Nittany. 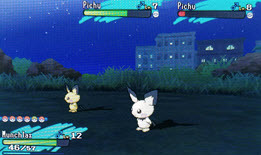 I like the way that the game asks what you want to do with newly captured Pokemon. In the past, it automatically sent them all to a computer. Now, it asks if you'd like to add it to your team instead. It saves me a lot of trips to the Pokemon Center to switch around the members of my team. 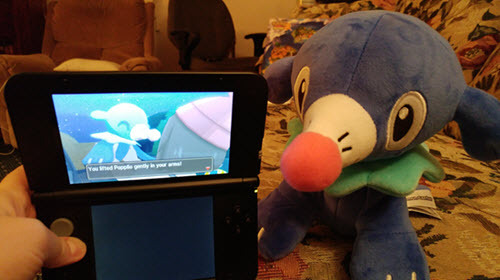 I'm thankful for the Munchlax that was distributed via Nintendo Network. It came with Hold Back, a move that attacks but doesn't cause the other pokemon to faint. I have no idea how I would have captured all the mons that I did without that.